I am an insect biologist. My research focuses are on insect chemical ecology, insect molecular biology, biochemistry and functional genomics to improve our understanding of insect behaviors, insect-host interaction and evolution. I received my PhD in the Department of Entomology at the University of California, Davis (UC Davis) in June, 2010 under the supervision of Dr. Walter Leal, a leading authority in insect chemical ecology. My research project was “Olfactory (Smell) proteins in moths and mosquitoes”. I came to Australia with an OCE (Office of the Chief Executive) Postdoctoral Fellowship and joined CSIRO Ecosystem Sciences (CES). My study focus is the molecular mechanisms of insect chemosensory systems and their functions in insect-host interaction and co-evolution. 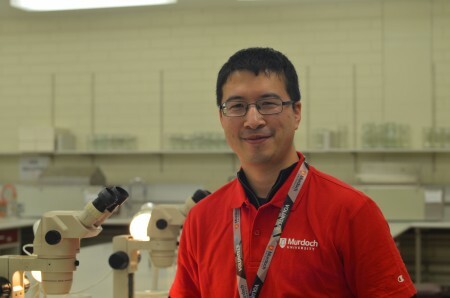 I joined Murdoch University in January 2015 as a lecturer in Entomology in the School of Veterinary and Life Sciences. Entomology, Insect Chemical Ecology, Functional Genomics and Insect Molecular Biology. Insects, one of the most important groups of organisms, live in a world of chemistry. They rely upon smell (the olfactory system) to detect mates, food and oviposition sites. They rely upon taste (the gustatory system) to evaluate which foods to feed on and which foods to avoid. My research is focused on insect olfactory and taste systems at the molecular level. I will also dissect how these insects have fine-tuned their chemical sensory systems to sense their environment and regulate their behaviours. Understanding the molecular basis of these mechanisms will provide a vital tool for assessing crucial natural interactions of hosts and insects, as well as allowing us to develop new strategies for insect control through disruption of chemosensory mechanisms. Protecting crops against damage from insect pests and transmitted diseases is an ongoing challenge. Insect reliance on their senses to detect food has considerable potential for the development of odour-based behaviour control methods. This project will develop new insights into the underlying insect smell systems and identify potential attractant compounds in support of the development of environmentally safer insect pest control strategies to strengthen Australian agriculture and biosecurity. 2016 APEC Science Prize for Innovation, Research and Education (ASPIRE) Australia Runner-up Prize (only one champion and two runner-ups every year). 2010-2013 CSIRO OCE (Office of the Chief Executive) postdoctoral fellowship. 28th International Society of Chemical Ecology (ISCE) annual conference travel award, 2012. 6th Asia-Pacific association of chemical ecology conference organization award, 2011. 8th Chinese national chemical ecology conference paper competition, 1st Place, 2010. 56th ESA annual meeting president’s award, 2008. Xu W. Molecular basis of response to post-harvest treatment stresses. 2018 PBCRC Scientific Exchange Program, Melbourne, Victoria, Australia, May 28-31, 2018. Xu W. Molecular basis of Fruit fly response to (sub)lethal stresses. Science Protecting Plant Health in Brisbane, Queensland, Sep 25-28, 2017. Xu W. Molecular basis of Fruit fly response to (sub)lethal stresses. The 1st Australia-China Conference on Science, Technology and Innovation (ACCSTI2017) in Perth, WA, Feb. 2-6, 2017. Xu W. Molecular basis of Fruit fly response to (sub)lethal stresses. 2016 PBCRC Scientific Exchange Program, Creswick, Victoria, Australia, Oct. 25-39, 2016. Xu W. Expansion of a taste receptor family in a polyphagous insect herbivore. 2016 International Congress of Entomology (ICE) in Orlando, Florida, USA. Sep. 25-Oct. 1, 2016. Xu W. Molecular basis of response to postharvest treatment stresses. 2016 TAAO Symposium, Putrajay, Malaysia, Aug. 15-18, 2016. Xu W. Expansion of a taste receptor family in a polyphagous insect herbivore. The 16th Australasian Association for ChemoSensory Science (AACSS) conference, Canberra, Australia. Dec. 2-4, 2015. Xu W. Chemosensory genes from cotton bollworm Helicoverpa armigera. International Chemical Ecology Conference (ICEC), Melbourne, Australia. Aug. 19-23, 2013. Xu W. Chemosensory genes from cotton bollworm Helicoverpa armigera. The 14th AACSS conference, Melbourne, Australia. Aug. 16-18, 2013. Xu W., Zhang H. and Anderson A. A sugar gustatory receptor identified from the foregut of cotton bollworm Helicoverpa armigera. The 28th International Society of Chemical Ecology (ISCE) annual conference. Vilnius, Lithuania, Jul. 22-26, 2012. Xu W., Zhang H. and Anderson A. A sugar gustatory receptor identified from the foregut of cotton bollworm Helicoverpa armigera. XVI International Symposium on Olfaction and Taste (ISOT) conference. Stockholm, Sweden. Jun. 23-27, 2012. Xu W., Papanicolaou A. and Anderson A. Olfactory receptors from cotton bollworm Helicoverpa armigera. The 13th AACSS conference. Matakana, New Zealand. Dec. 7-9, 2011. Xu W. and Leal W. Navel Orangeworm Moth (Amyleois transitella) Pheromone-Binding Protein 1 (AtraPBP1). The 6th Asia-Pacific Association of Chemical Ecologists (APACE) conference. Beijing, China. Oct. 11-15, 2011. Xu W. and Leal W. Odorant Binding Proteins from Malaria Mosquito Anopheles funestus. The 8th Chinese National Chemical Ecology conference, Shanghai, China. Oct. 9-12, 2010. Xu W. and Leal W. Study on Aedes Aegypti odorant binding protein-1. The 92th ESA Pacific Branch annual meeting, Boise, ID, USA. Apr. 10-13, 2010. Xu W. and Leal W. The localization of Culex quinquefasciatus odorant binding protein-1 (CquiOBP1). The 56th ESA annual meeting, Reno, NV, USA. Nov. 16-19, 2008. Xu W. and Leal W. Study on odorant binding proteins from malaria mosquito Anopheles funestus. The 91th ESA Pacific Branch annual meeting, Napa, CA, USA. Apr. 1-3, 2008. Xu W. and Leal W. Molecular Switch for pheromone release from Bombyx mori pheromone-binding protein. The 90th ESA Pacific Branch annual meeting, Portland, OR, USA. Mar. 25-28, 2007. Xu W. and Leal W. Molecular switch at the C-terminus of BmorPBP. The 54th ESA annual meeting, Indianapolis, IN, USA. Dec. 10-13, 2006. Australia Association of Chemosensory Science (AACSS) ordinary member (2015 – Now). Scientist in School program in Harrison School, Canberra, ACT, 2012-2013. Symposium “Chemical ecology meets evolutionary and molecular biology” co-organizer, 28th ISCE annual conference. Vilnius, Lithuania, July 22-26, 2012. Symposium “Olfaction and receptors” co-organizer, 6th APACE conference. Beijing, China. Oct. 13th, 2011. You should list the students you are supervising or have supervised and the topic areas covered here. Dr Antonios Augustinos (2016-2017), currently a research entomologist in International Atomic Energy Agency (IAEA), Vienna, Austria. Vineeta Bilgi (2016-2017), currently a research entomologist in Department of Primary Industries and Regional Development (DIPIRD). Al-Behadili F, Bilgi V, Li J, Wang P, Taniguchi M, Agarwal M, Ren Y, Xu W (2019). Cold Response of the Mediterranean Fruit Fly (Ceratitis capitata) on a Lab Diet. Insects 10 (2), 48. Grater F, Xu W, Leal W, & Grubmuller H (2006) Pheromone discrimination by the pheromone-binding protein of Bombyx mori. Structure 14(10):1577-1586. Chen J, Sun F, Shi Y, Xu W, et al. (2005) Efficient expression of vip184 Delta P gene under the control of promoters plus Shine-Dalgarno (SD) sequences of cry genes from Bacillus thuringiensis. J Appl Microbiol 99(2):426-434. Shi Y, Xu W, et al. (2004) Expression of vip1/vip2 genes in Escherichia coli and Bacillus thuringiensis and the analysis of their signal peptides. J. Appl. Microbiol., 2004, 97:757-765. Yu JX, Xu W, et al. (2002) Cloning and expression of cyt2Ba7 gene from a soil-isolated Bacillus thuringiensis. Curr Microbiol 45(5):309-314.